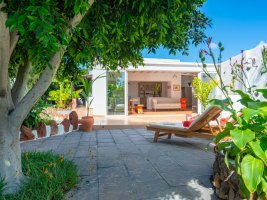 Rural Villas in Lanzarote - Away from the main resorts and the bustling crowds there is an altogether different Lanzarote just waiting to be explored. Thanks to the small size of the island and the excellent road networks it means that staying in a Lanzarote rural villas does not mean you are cut off or ever very far from a beach. Just visit our main Lanzarote villas page if you would prefer to book holiday accommodation in one of the main resorts. Rural villas in Lanzarote may be relatively new but tastefully built in keeping the Lanzarote architecture or may even be converted from one of the old fincas that are hundreds of years old but either way the relaxing atmosphere and stunning rural scenery is what keeps bringing visitors back year after year. Many rural villas will still have private pools and are an ideal base to explore the whole island and get a taste of the true Lanzarote. 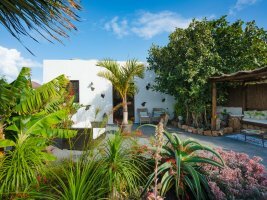 Browse our range of Lanzarote rural holiday villas below. Ideal for garden lovers. Stylish rural accommodation for two just five minutes drive from the beach at Arrieta. This property can be combined with the Finca Botanico Garden Apartment for parties of up to 6 people.